The provincial government has passed legislation in the final days before the Christmas break to implement recommendations of the Dean Report, changing the rules regarding trades certification and clarifying that the Ontario Labour Relations Board (OLRB) rather than the Ontario College of Trades (OCOT) will be responsible for adjudicating scope of work disputes. The legislation cancels the Carpenters Union’s compulsory certification initiative and has angered existing certified trades, who argue that the legislation will allow unqualified workers to do portions of their jobs – but representatives of the non-certified trades and the Labourers’ Union have applauded the revisions. “On December 8, the Ontario Legislature passed amendments to the Ontario College of Trades and Apprenticeship Act, 2009 (OCTAA) that will enhance the College’s role in keeping Ontarians safe, with an increased focus on risk of harm and consumer protection. As of June 6, 2017, College inspectors will have the ability to issue Notices of Contravention reflecting administrative monetary penalties, rather than tickets with fines under the Provincial Offences Act. Where requested, reviews of the issuance of a Notice of Contravention will be heard by the Ontario Labour Relations Board (OLRB). The OLRB will be required to consider risk of harm issues, scopes of practice, the objects under the Ontario College of Trades and Apprenticeship Act, plus the College’s new Compliance and Enforcement Policy. The legislation sets out guidelines for a “classification roster,” removing the ability of the trades themselves to lobby for changes and then vote/control the decision-making process, resolving a concern of many construction business owners. Under the new rules, the certifications will be determined by a “classifications panel” based on members of the new classification roster. The legislation says the “associate chair and at least six other members should be appointed as representing the public.” The remaining four members should be “appointed from the roster of adjudicators” and these may have relevant trade experience. The legislation specifically says that existing classification reviews (such as for general carpentry) will be cancelled; meaning that if the carpenters wish to seek compulsory certification, they will have to restart from scratch. The scope of work issue created much controversy, when labourers and non-certified trades on unionized job sites, doing work they had traditionally done for years, started receiving tickets from OCOT inspectors. Tony Dean recommended that scope of work adjudications be handed to the OLRB and this decision is reflected in the legislation, over the objection of the certified trades. About 4,000 workers representing certified trades protested at Queens Park on Nov. 30 when they realized the new legislation was imminent. 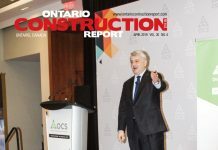 James Hogarth, business manager of the Ontario Pipe Trades Council, said in a published report that the OLRB would make decisions not based solely on scopes of practice requirements, but include other considerations including OLRB jurisprudence on union disputes and new guidelines including “risk of harm” — which can mean different things to different people. Non-compulsory trades are understandably more positive about the changes, saying enforcement that was biased in favour of the compulsory trades will now, they hope, be more balanced. 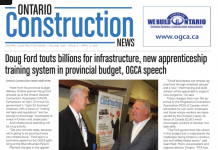 “We just want to level the playing field … Right now they don’t have anywhere to go (for an appeal), and it’s just wrong,” Joseph Maloney of the Coalition of Non-Compulsory Construction Trades of Ontario, told TV Ontario. Maloney says the compulsory trades used the OCOT to shift work away from non-compulsory workers. It’s a charge that’s widely heard in the construction industry, and one Hogarth partially acknowledges, TVO reported. “To a certain degree, they’re right,” Hogarth says in an interview reported by TVO. “Some trades did over-step, and were looking at the College as the golden goose.” Hogarth suggested to the network that both sides of the industry to come together without weakening the OCOT, and ideally, without the involvement of the labour relations board. Labour minister Kevin Flynn defended the government’s changes in an interview with TVO.org. “We brought forward these amendments, a lot of building trades agree with us, the voluntary trades agree with us, we’ve got a large degree of support from the business itself, but unfortunately a few others still have problems with the bill,” Flynn was quoted as saying. “He (Flynn) also acknowledged that the compulsory trades’ reaction — with protests and strident warnings that public safety could be at risk, by potentially allowing uncertified trades to do work in delicate, context-sensitive jobs like electricity or plumbing — lends some credence to the accusation that those trades were using the College to protect their own turf. The government allowed some amendments to Bill 70 before putting the bill to final reading and Royal Assent, one of which requires the OLRB to give due consideration to the core purposes of the OCOT — elevating the status of the trades, professionalizing and formalizing them, and protecting the public interest — when it makes its decisions.